What to do if I supplier places you on stop. It is common practice within credit control to place a customer “on stop“ if they have not kept their credit account sufficiently up-to-date. What this means is that the supplier refuses to provide further goods, until the credit account has been paid up to date. This can cause a significant problem for the debtor as they may need further supplies in order to generate funds to pay their account. There are a number of possible actions that could be considered. The easiest action is to pay the account up to date. Assuming that you don't have the cash on hand, you could try pressing some of your own customers for payment, in order to generate some funds. If you need tips on credit control see our free guide. Another option is to find other suppliers that can provide the same products on credit terms, and open accounts with them. Unfortunately, it is not always the case that another company can provide exactly the same product or service. Secondly, there could be pricing differentials between the two suppliers, which could mean that you end up paying more for the goods, or services, that you require. It is also worth noting that if you have already run up credit with one (or more) suppliers, just finding further providers to supply you could increase the amount of debt that you have to carry going forward, beyond what you can manage. Also, if you have credit problems generally, such as poor credit or payment history, you may find that it is difficult to find credit from alternative suppliers. 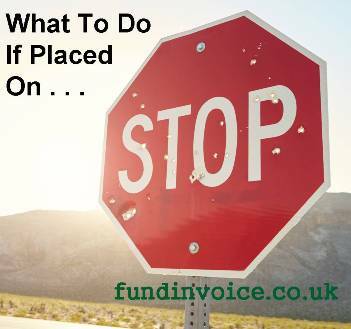 It may be that you are able to negotiate with the supplier that has put you on stop. It is possible that with a a full and frank explanation of the situation that you are in, they may take a different tack and be prepared to supply you with further goods. However, there is no guarantee of this and if they operate an aggressive credit control policy, they may well choose not to provide further products or services. You may be able to negotiate a small part payment, in order to unlock further vital supplies. Another way of tackling the problem is to raise the money required to pay your account with the supplier, and have your account taken off stop. Accounts receivable financing is one way of doing this. This type of finance relies on you having an outstanding sales ledger of credit invoices, of which the receivables financing company will release a proportion to you, in the form of a prepayment against those invoices. This accelerates your cash flow. The funds received from this prepayment can then be used to pay your suppliers. It is also worth noting that in some cases you may be able to pay your suppliers quicker, which could mean that you qualify for additional purchasing discounts for early payments or purchasing on cash terms.